Chip Douglas is out of the shop Nov 3-5 and will be tattooing at Rock of Ages. Brandon Heuser and Kevin Leary are out of the shop Nov 8- 12 and will be tattooing at the New Orleans Tattoo Convention. Matt Beatown Ziolko is out of the shop Nov 9-12 and will be tattooing at Tattoo Paradise DC. Nick Colella and Mario Desa are out of the shop Nov 15-19 and will be tattooing at the St. Louis Tattoo Expo. To book in with any of our tattooers e-mail, call, or swing by the shop as a walk-in. Contact us today. To book in with any of our guest artists click on their name below to be directed to their instagram. Any other questions can be directed to Great Lakes Tattoo. 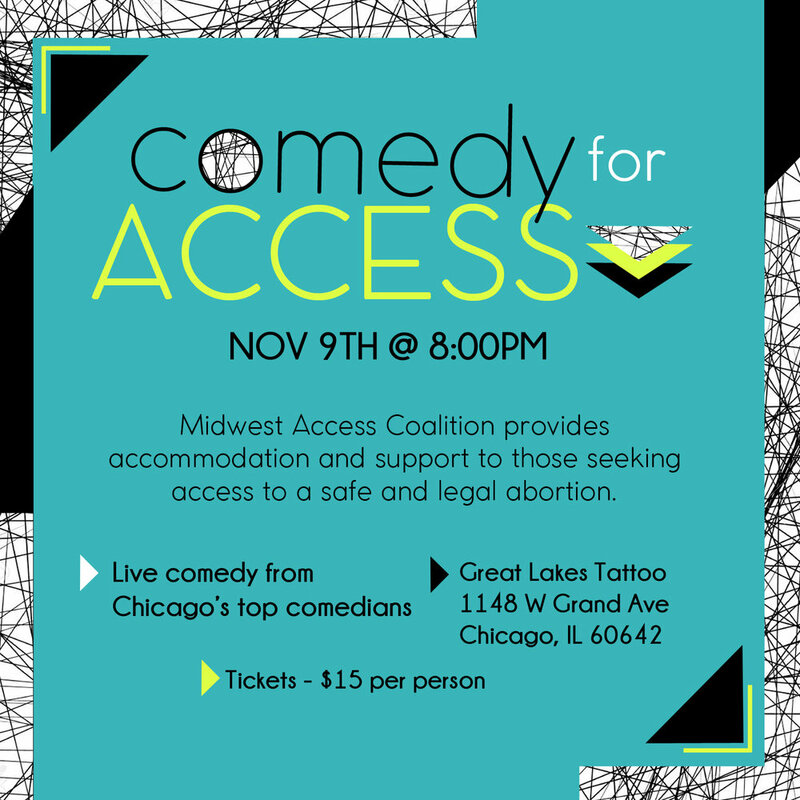 We are proud to co-sponsor along with Audrey Jonas "Comedy for Access" - a pop-up comedy show here at Great State Gallery (lower level of Great Lakes Tattoo) on Nov 9 at 8 PM! All proceeds will benefit the @midwest_access_coalition, which provides accommodations and support to people traveling to the Midwest to seek a legal and safe abortion. They have also found an anonymous donor who will match all ticket sales! They will also have complimentary beer and cider, and some exciting raffle prizes from local restaurants!